On the March for Science last year. It is welcome to see the Government commit to further participation with the European Southern Observatory. This something which I lobbied for in last year’s budget and will be welcome news for the industry this year. In addition to this the new disruptive technologies fund of €500 million is very welcome in the changing technology industry. However beyond those two items it is a disappointing budget for the science and technology sector. There has been a failure to engage with CERN. In my opinion this is an opportunity missed. The Government’s failure to commit to CERN is a strong blow to the scientific community in Ireland. Earlier this year, I visited CERN in Geneva to explore the possibility of Ireland joining the organisation and to build relationships with their executive team. It is clear that the opportunity for Irish researchers to work in CERN is a phenomenal one. CERN has proven to be an incredibly successful international collaborative body. The approximate annual fee of €10 million for membership of CERN is entirely justifiable based on the return to the State from contracts, investment, and further research opportunities. It is incomprehensible that the Government would not allocate the funds needed to join this important institution. Ireland, along with Malta and Luxemburg, is one of only three EU member states that is not currently a member of CERN. If the Government wishes for Ireland to be at the forefront of science, research and development, then joining CERN was a must. The government is effectively isolating Ireland from some of the most important research of the century and damaging our reputation in the global scientific community. 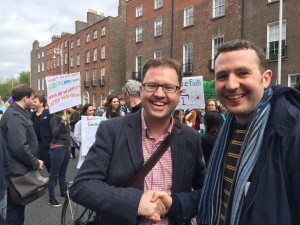 For the next year, Ireland will continue to suffer in scientific, educational and research circles as a result of the Government’s short-sighted decision. This another budget which sees no finance for third level research outside the Science Foundation Ireland centres and no successor to PRTLI funding. Irish researchers and scientists who want a seat at the top table of global research face another year of frustration or moving abroad. As Science and Technology spokesperson I am disheartened by today’s outcome, but I will continue to fight on behalf of the scientific community in Ireland until the Government fully recognises and supports the extraordinary work that our scientists do for our country.